The Hotels.com Gift Card is redeemable towards bookings at hundreds of thousands of places to stay in 200 countries and territories, ranging from international chains and all-inclusive resorts to local favorites and bed & breakfasts. Redeemable on Hotels.com, the Hotels.com Gift Card can be used in conjunction with member-only-deals and promotions. 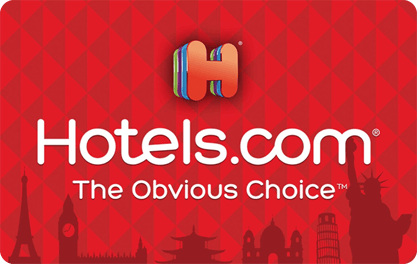 Bookings with the Hotels.com Gift Card count toward free nights with Hotels.com® Rewards where customers can earn a free* night for every 10 nights stayed. For more information visit www.hotels.com/giftcards or e-mail giftcards@hotels.com. *Subject to Hotels.com Rewards terms and conditions, as set out at www.Hotels.com.